I loved changing Mac's nursery into a big boy room that I call "Farm Chic." Navy is one of my favorite colors and I added pops of green in the art, pillows and side table. For a touch of manliness I used my husbands pig mount and deer hooves hooks over the bed. Long before I decided on colors and fabrics for the room, I found the cow print from Ikea. That set off the idea of doing a sorta of farm theme but still modern. My decorating style is traditional but I like to add unexpected things. I want my home to feel casual, comfortable and collected with things that I love. My favorite items are the throw pillow made from otomi fabric, the buffalo check panels and the acrylic book shelves. Find something you love and let that be your starting place. 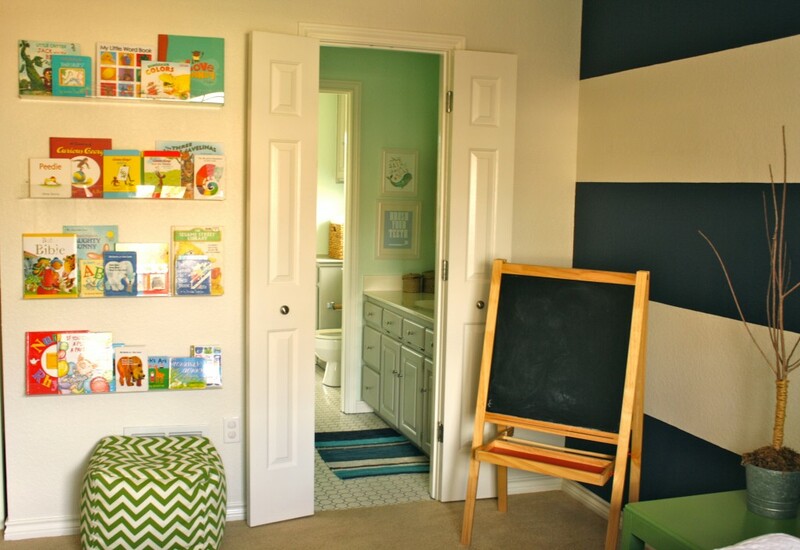 I also love painting walls white, especially in kids rooms (that sounds wrong, right? ), because it gives you a blank palate to work with. It goes with any color, gender and will grow with your child. For more check out my blog I Love That! LOVE this room. Way to go. It’s a style I am thinking about for my boys room for our upcoming move. Great job, love it! Love the striped wall and rustic accents. My boys also have those PB curtains and acrylic book shelves:). what colors did you use on the wall i love that navy!